At the beginning of an article, I write a short introduction that seeks to inform you about the content I’m going to cover and also some of the context behind why I have chosen to write about that topic. Anyway, I finally got around to replaying Gears of War 4 recently and one of the many things that struck me about it was… you guessed it, the prologue. Naturally, I couldn’t help but consider some of the (very intentional) parallels between this game and Halo 4. Both were the product of a new studio made to handle an established and well-loved franchise, setting the stage for a new chapter in their respective series, picking up – after novels and spin-offs – some time after the third instalment’s conclusion. And, y’know what? Both are absolutely fantastic games. I thought it’d be fun to examine what makes their opening scenes so successful. Of course, before we get to examining the prologues themselves, we have to establish some of the fundamental things about what a prologue is. A prologue is a literary device that you’ll probably have seen no end of (especially if you’ve studied ancient Greek dramas). They come at the very beginning of a story, giving us some degree of context about the events that occurred leading up to the story we’re about to see. That is not universal, however. Some prologues may actually be scenes that take place at some point during the main events of the story, which will be returned to later. Sometimes the actors will directly address the audience to tell them about what’s they’re going to see. An example of this is one of the most famous prologues in literature: William Shakespeare’s Romeo and Juliet. Romeo and Juliet is both a romance and a tragedy, so this prologue tells us the entire story before it happens (that the events of this play will be tragic – the fates of these characters are sealed) and it is delivered in the form of a sonnet (a love poem). We’re told everything we need to know: the setting, the characters, the plot, the conflict, and the ending. Baz Luhrmann’s… shall we say bombastic film adaptation keeps this opening speech and presents it through the lens of a news reporter on a television screen with a black background, keeping that element of directly addressing the viewer. But I won’t bog you down with a dry analysis of quatrains and couplets, we’re going to look at a few modern examples before we get to Gears of War 4 and Halo 4. Me, though? I love a good prologue, it’s been a specific fascination in writing for me since reading the play Frogs by Aristophanes – a comic playwright of Classical Athens. The play tells the story of the god Dionysus lamenting the state of Athens’ writers, so he travels to the Underworld with his (more intelligent) slave, Xanthias, to bring Euripides (a famous tragedian) back from the dead. Dionysus acts as a judge and decrees that the winner will return with him to the world above to save the city of Athens from bad writers. Prologues are decidedly unpopular with publishers, who will often skip them to get straight to the first chapter. This seems unfair, but comes as the product of a lot of bad prologues from writers who commit a number of basic errors in using them. Info-dumping – using a prologue to front-load the text with copious details about the world, rather than unpacking this information naturally over the course of the story. Depicting something that has no relation to the story – a scene that lacks any meaningful relevance and therefore does not do anything to propel and impact the narrative. Quite simply, making them go on for too long. To use another Shakespearean proverb, brevity is the soul of wit; don’t waste time disrupting the pacing and flow of your story’s structure, just get to the point. Interest has to be earned, after all. A good prologue should hook you into one or more of the main aspects of narrative: character(s), setting, themes, tone, and action. It should make you ask questions about those things, often with some element of foreshadowing that will pay off later (giving the prologue utility in the narrative), and provide some sort of context to be explored. I’d like to briefly examine three examples of this in television, literature, and gaming – two successful ones, and one not. The third season of this incredible show concluded recently, and, after a cancellation scare, it has been picked up by Amazon to be continued (for which I am thankful because this is one of the best shows on television). In order to tide myself over until that time, I have started watching the show from the beginning again. 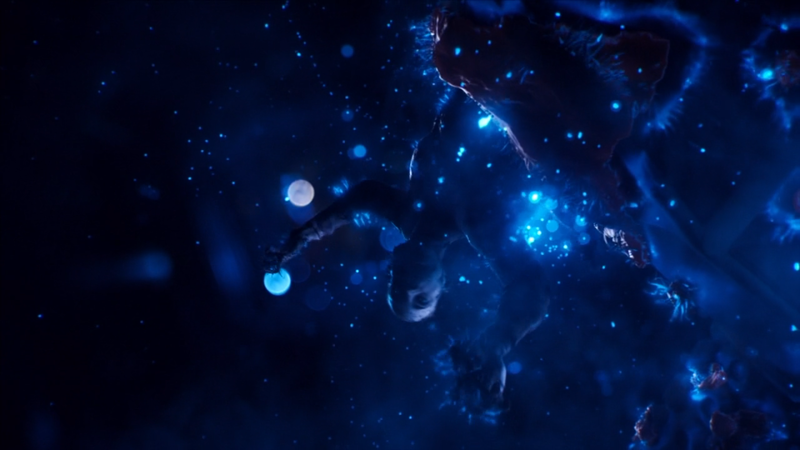 The Expanse begins with Julie Mao, a young woman who awakens on a ship that seems to be adrift in space after an attack that killed the rest of the crew. After breaking out of her room, she finds blood on the walls – clear signs of a fight. And then she sees one of her crewmates, still conscious and aware, being absorbed by it. This is not a ‘necessary’ scene in order for the plot (which largely revolves around Miller, a detective, trying to find Julie) to happen. Julie is not a main character, she’s the person who’s gone missing – she’s what we’re narratively in pursuit of. So why start with her? Well, without this scene, we have no idea of what the true stakes of this story are. It’d be like any other ‘detective tries to find lost woman’ story, of which there are far too many. But, by starting with this scene, we know there’s more going on. Suspense is created because we know that there’s the story doesn’t end when Miller finds Julie (if, indeed, he does). Every step Miller takes that gets him closer to his goal of finding Julie is a step closer to that strange, alien danger – the Protomolecule. We can only experience this moment from Julie’s point of view, so it naturally fits as a prologue to The Expanse and concisely articulates what is to come. The Protomolecule becomes one of the central conflicts of the show, so it sets up a long-term issue that the characters have to deal with; we are given both the emotional stakes that revolve around the characters, but also a hint of the effects on the wider setting too. Before moving onto the next example, I urge you to watch this show. You won’t regret it! George R. R. Martin’s acclaimed A Song of Ice and Fire series begins in a very similar fashion to The Expanse, in terms of having a contained opening that sets up a long-term antagonistic force with wider implications on the setting. I mentioned earlier that the prologues-of-old would directly address the audience, which we would refer to as ‘breaking the fourth wall’ today – the imagined and assumed ‘wall’ that separates actors from the audience, which we may peer through but the actors may not peer back (or so is considered to be the convention). The same is true of literature where direct address to the reader typically occurs through a preface or foreword (and often from a writer that isn’t the author of the text), so writers have had to be a bit more inventive in the ways in which they speak to the audience. Meta is a type of writing that one might describe as ‘self aware,’ in that it places particular emphasis on the fact that it is constructed – that the reader is, in fact, reading a work of fiction. The literary form and style, language, and storytelling is acknowledged in some fashion. It might be explicit, where the narration comments upon the text; or it might be, more subtly, a second layer of commentary to the narration and dialogue. A Game of Thrones is a good example to use with regards to the latter because George R. R. Martin is somebody whose works invite multiple readings – these are books that need to be read more than once. 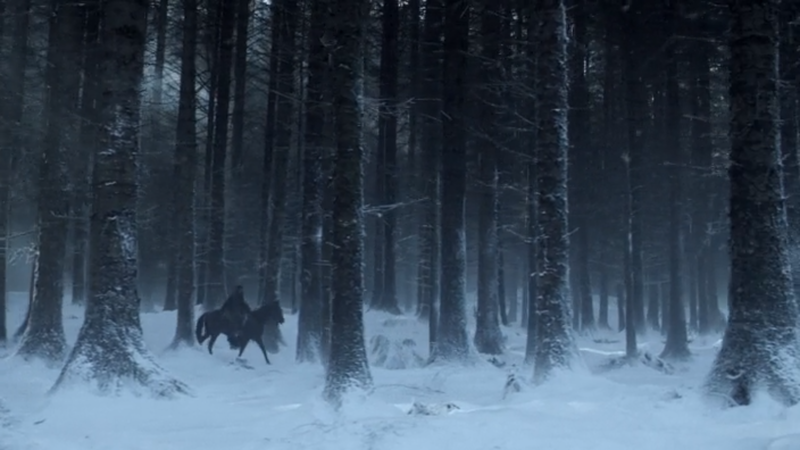 When the woods grow dark, as the density of the text grows (leading to the innumerable fan theories that look to piece together bits from each book), we should go back to where we began. George knows that these are complex books, and there is always value (for both writer and reader) to return to the beginning. This line (and the rest of the prologue) additionally informs us of the greater suspense; this may be a ‘realistic’ fantasy story with knights and castles and politics, but it is a story of multiple genres. There are strange creatures (that the show very boringly articulates as ice zombies) and magic at play here, too. So, those are two examples of well-done prologues. What about one that’s… not done so well? 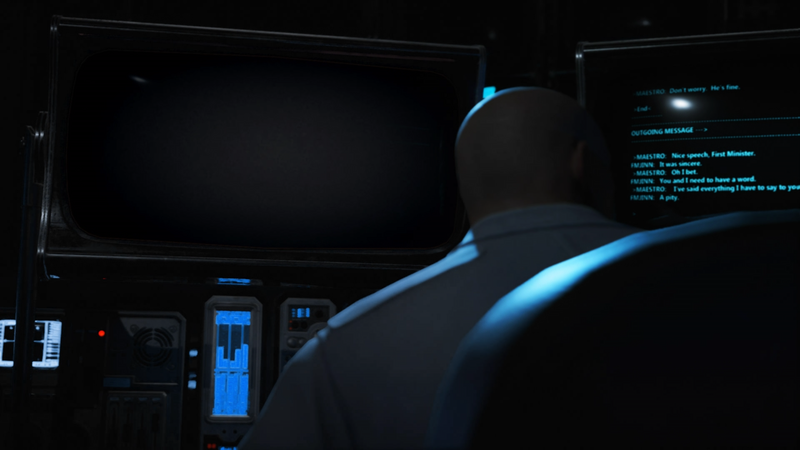 The prologue to Halo 5 is a short scene of Catherine Halsey entering her lab (presumably at CASTLE Base on Reach), grabbing an armoured matrix (which is used to house AI data chips), and smiling at Cortana as she is transferred to the chip – the smile fading as the room darkens. While this is happening, a brief bit of future dialogue from Halsey plays over the scene. It’s meaningless in the context of Halo 5’s story. The setting isn’t clear to anyone who doesn’t know that Halsey created Cortana on Reach; the main action in the scene we are meant to visually consider (Halsey’s smile) never sees any exploration in the game; the dialogue bears no relevance to anything that occurs over the subsequent fifteen missions either, as the story set up with ONI is swiftly pushed aside. To give this scene more credit than it deserves, on a meta level, it feels like it exists to tell us that 343 is committed to this course with the Created in the future – damn everything else. It does nothing to propel and impact the narrative, providing no substantial set-up for the events of the game. It raises questions that Halo 5 will not endeavour to answer (a recurring issue throughout Halo 5). This is, quite frankly, a prologue that a publisher would skip. If you were to simply open with Fireteam Osiris’ mission briefing about rescuing Halsey, players who are both familiar and unfamiliar with the expanded universe would not be missing out on anything. We’re both on the same level of confusion. As the fifth instalment in the mainline series of games, following on from Halo 4 and Spartan Ops, as well as half-a-dozen novels and a comic series that spanned two years, the onus was on Halo 5 to open with a prologue that would… actually serve as a prologue. It needed to acknowledge the major events that would be useful to people who aren’t… well, who aren’t like me. Halo media is like oxygen to me. I make a concerted effort to consume everything. Most people can’t (or simply don’t) do that. Consider just how jarring it is going from Halo 4 to Halo 5, not just for the average player but everyone who followed the progress of this story – factoring in Spartan Ops and all the other peripheral media. But what if I told you that there is, in fact, a prologue scene to Halo 5 that does do (most of) these things? The reality of the matter is the fact that none of these plot points actually bear any relevance to Halo 5’s story at all. If they had actually done this ‘recap’ scene at the start of the game, they’d have undoubtedly had the playerbase scratching their heads in confusion more than they already were. Euripides: Let’s turn to your prologues. I maintain that they fail to give a clear outline of the opening situation. Aeschylus: Which prologues do you propose to criticise? Euripides: Quite a few. But let’s start with the one from the Oresteia. Hear now my prayer, and be my ally and saviour! Dionysus: Do you find anything to criticise in that? Euripides: A dozen things at least. It’s a feast for the eyes, with its layered visual storytelling; it’s a feast for the ears, with its amazing music (this particular score, Sacrifice, coming from Kazuma Jinnouchi – who recently left 343 – that even has thematic relevance, as Halo 4 is about a much ‘quieter’ kind of heroism); and it’s a feast for people interested in the more complex writing that Halo 4 promises, with its much stronger connections to the expanded universe. This is made clear from the very first shot of the game, which depicts rows upon rows of pods shaped like MJOLNIR helmets. As we close in on one of them, the only one with the lights on, we see the defiant gaze of a young boy within the ‘helmet’ – John-117. It is this single image that encapsulates the entire scope of what Halo 4 intends to do with its character writing, in its exploration of the Master Chief. Our first shot of the game is seeing him as a child, which will be echoed at the end of the game – in the epilogue – where we see him unmasked after the physically debilitating and emotionally harrowing events of the story. From the beginning, Halo 4 sets off with set-up that it gradually builds upon with emotional context. Cutting to a shot of Halsey’s eyes, where one side of her face is obscured in darkness while the other is in the light (simple visual communication of the character’s moral ambiguity), we explore – through her interrogation – her role in the Halo universe, at long last, in the games. While she was present in Halo: Reach, the character’s importance was never explored. Returning to the idea of meta writing, this prologue is full of it. The very first lines of the game carry some sense that the player is being asked this as much as Halsey is. It is natural that a new game in a series is going to bring in new players, but then you’ve also got players who are unfamiliar with the expanded universe material even though they’ve played the games. “Tell me about the children,” is a question that will either immediately click in the player’s head, as they know the whole backstory of the Spartan-IIs, or will be unfamiliar. In the case of the latter, this prologue is the first time a Halo game will fill in those details. Most people don’t know that. Y’know, there’s maybe eight million Halo players out there who are completely unaware of his origin and it’s definitely something that we’re sort of passionate about because it’s formed him. And it’s one of the things that separates him and differentiates him from all of the other military forces from Earth. By beginning with an outline of the Spartan-II project, from Halsey herself, a definitive statement is made about what kind of story this is going to be. These are not just being addressed to Halsey. The reason why the Spartan-II project is such a brilliant and definitive aspect of the Halo universe is because it’s something that everybody has a different view on. Prologues are supposed to raise questions that will be dealt with, and while these questions will be explored there is quite pointedly no definitive answer given to them – you have to grapple with those questions too, this is what Halo is asking you now. It’s no longer just about a cut-and-dried conflict of humanity fighting aliens; you have to address the fundamental morality behind the reason why hero you play as exists. This is given something of a ‘cracked mirror’ later in the game when it is revealed that the Prometheans, the Didact’s warriors, are created through a similar process of trapping the essence of somebody within a suit of armour – just as we see John as a young boy within that helmet-like pod. Another major aspect of this prologue scene is the battle depicted as the Interrogator and Halsey discuss the impact of the Spartan-IIs. Some people misconstrue this particular part of the scene as being more literal than it’s intended to be, as this is the first time Halo has really dabbled with this kind of visual storytelling. It begins with a CAS-class assault carrier approaching a human city, framed from below in a low-angle shot that echoes the opening scene of A New Hope. We see the long reach of the Covenant as the vessel passes overhead, dominating the top half of the screen. Thousands of smaller craft begin pouring out of the ship, like swarms of tiny insects. Banshees bombard busy streets, filled with helpless civilians; an energy sword-wielding Sangheili impales one as he flees. We are given a clear illustration of how outmatched humanity was against the Covenant. Seven Spartan-IIs drop from two Pelicans and land between the civilians and the Covenant, they immediately manage to hold the line and turn the tide against them. People have noted the canonical inconsistency in this scene with regards to the armour the Spartan-IIs are wearing, and the ‘real life’ explanation is simply the fact that 343 didn’t have the time or budget to build a whole other CG Spartan model with older armour for a what amounts to a couple of seconds of footage (as Josh Holmes has stated). But, at the same time, it is important to remember that this battle is intended to be a purely symbolic depiction of the Human-Covenant war rather than a representation of a specific one that actually happened. Unlike, say, the battle depicted in the prologue of Halo Wars, which specifically focuses on the battle of Harvest, this isn’t meant to be literal. Lastly, there’s the set-up of the idea of humanity’s destiny – something Halsey believes her Spartans embody, when the notion of the Master Chief being ‘replaced’ comes up. You could remove this prologue and the plot of Halo 4 would be largely unaffected, just as was the case with The Expanse, as neither Halsey nor the Interrogator are present in the story – though Halsey is mentioned. However, this scene is essential in (re)contextualising the Halo universe and subtly establishing a lot of the themes and concepts that will be relevant in the campaign, as well as Spartan Ops (which Halsey is a major character in) and the Reclaimer Saga as a whole. On top of that, it serves as a general refresher on the conflict that defined all of the previous games – the Human-Covenant war. There’s an element of suspense in seeing the gears of the Halo universe turn, to see the people move on without the Master Chief. We see later in the game, at the start of the second act, that the Chief has been ‘replaced’ (which is the cause of one of Cortana’s rampant outbursts in Reclaimer, the fifth mission). Every place you turn with this prologue, there is a layer of set-up for something that pays off in the campaign and is relevant in the long-term peripheral fiction. It doesn’t bog the player down with an infodump on specific events from the previous games, it’s something that – like A Game of Thrones – begs multiple viewings and playthroughs (such is the nature of video game storytelling, where it’s easy to miss story elements in the levels that you can interact with) to grasp the greater layers of context. Frankly, it is a brilliant introduction to Halo 4 and doubles up as a very memorable scene to begin this new saga. So, how do you improve on that? It is honestly no exaggeration to say that the prologue to Gears of War 4 is one of the best that has ever been pulled off in video game storytelling. The writers of The Coalition were acutely aware of how they needed to handle the new entry in this series they inherited, as 343 inherited Halo from Bungie. They knew that there would be new players coming in who had never played a Gears of War game before, as well as the existing fanbase, feeling that emotional cocktail of cautious anticipation. As of the time of release, it had been over five years since Gears of War 3; Gears of War: Judgement released in 2013, but that was also a title for the Xbox 360. This was going to be a new Gears game for a new generation. We are introduced to First Minister Jinn, head of the Coalition of Ordered Governments (COG), who serves as a secondary antagonist in the game. This subtly echoes Gears of War, the original, where Queen Myrrah narrates the prologue scene. We begin by learning a bit about Jinn’s backstory through her speech, and we get the impression throughout the campaign that her role is being set up for something major in the rest of the trilogy because a lot of the problems in this setting come back to the COG. 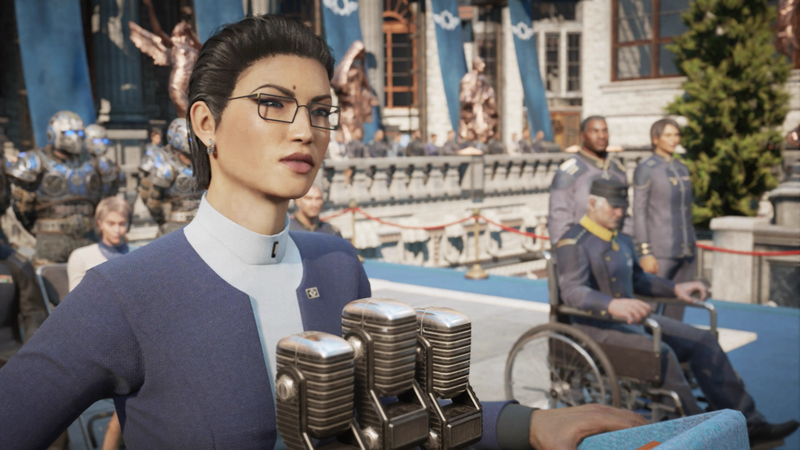 On her right, we see Samantha Byrne, Augustus Cole, and Victor Hoffman – three familiar, well-established characters from the original trilogy. Focusing on Hoffman, a veteran of all the major conflicts in the setting thus far, we then experience three flashbacks that take place during critical battles: Aspho Fields, a critical moment in the Pendulum Wars, where the COG acquired the Hammer of Dawn; E-Day (or Emergence Day), where the Locust first arrived; and Anvil Gate, the final battle of the Locust war – as seen in Gears of War 3. The key way in which this is ‘refined’ from Halo 4 is that it involves gameplay. It drops the player straight into the fight, which effectively serves as the tutorial. It gears you up for the gameplay. New players are made familiar with the mechanics and what they can expect from a Gears game, while returning players are treated to a nostalgia-fuelled history lesson with some of the franchise’s most beloved characters and some high-octane, classic Gears action. There’s the matter of perspective to consider too, as we are put in the shoes of ordinary COG soldiers who are under the command of the likes of Hoffman, Dom, Kim, and Bernie. In the first sequence during the Pendulum Wars, Dom and Hoffman enter a building to retrieve the Hammer of Dawn and the objective you are given is to buy them time by holding off the UIR’s forces. 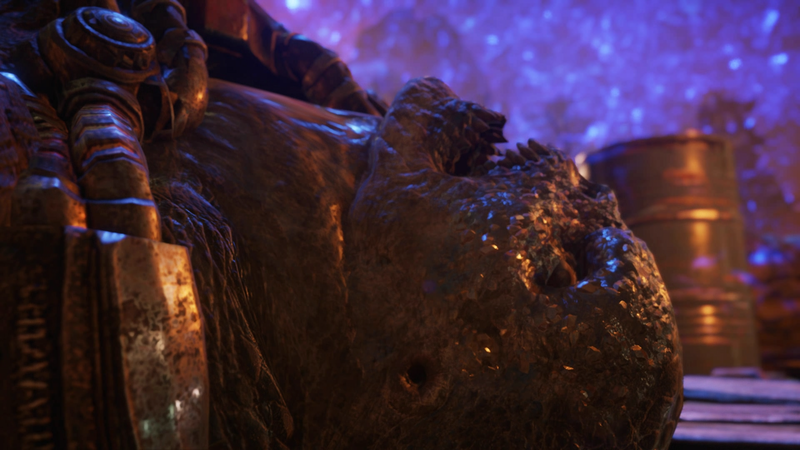 In the Aspho Fields and E-Day sequences, the character you play as dies – from the destructive chaos of the battlefield, and from a Locust Reaver. Even here, there is some great layering of objectives because the Aspho Fields sequence is about retrieving the Hammer of Dawn and then the E-Day sequence has the player use it to take down a Corpser. It doesn’t say “The Hammer of Dawn was key to fighting back against the Locust,” it gets to the point and has you use it to see first-hand how devastatingly powerful it was. In the final sequence at Anvil Gate, you play as a medic (teaching you the revive mechanic) and have to hold out against the final onslaught of the Locust horde – until the Not-Halo-Ring fires and wipes out the Locust. The final image we linger on is of a fallen Locust Drone, its face begins to crust over with a crystalline material that becomes relevant later in the story (so there’s that element of purposeful set-up here, too). The Swarm come as a reflection of the convenience of Gears 3′s ending, where they fired the Not-Halo-Ring and killed all the baddies. With all those corpses, we learn that they were just piled into mass grave sites and everybody moved on like they weren’t there, only to discover that – 25 years later – their nightmare has returned and transformed into something new. I love that. It’s actually made me retroactively like Gears 3′s ending, which, for years, I was immensely dissatisfied with. While the Swarm are the main enemies we fight in the game, they’re ‘secondary’ in the sense that they’re a cipher for the real problem in the setting: The COG. As I mentioned, First Minister Jinn’s role in Gears 4 was clearly set up for something greater in this trilogy, which I expect we’ll see Marcus and JD dealing with to some extent in Gears 5 as they split off from Kait and Del to return to New Ephyra. This layering gains even greater depth in the prologue, as Baird turns his attention away from Jinn’s speech to the monitor on the right where we smoothly transition to the next generation of Gears – with JD Fenix, Kait Diaz, and Del Walker. The transition is seamless. 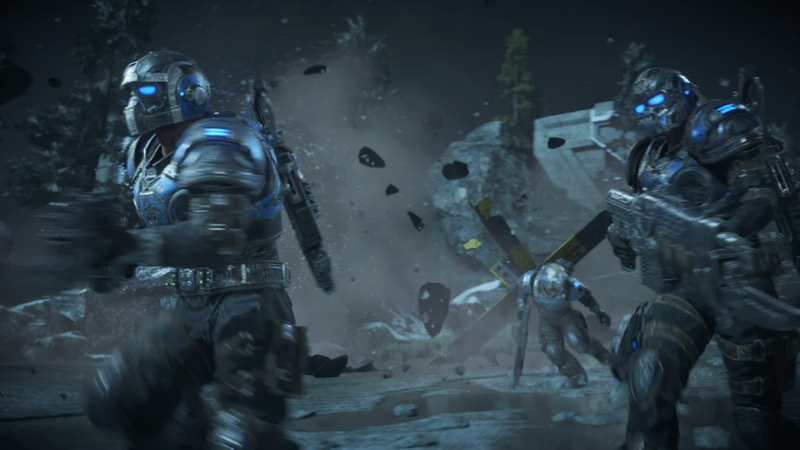 The worst you could say about the approach Gears 4 takes is that it is a little ‘safe,’ but the writing is strong enough to make that feel like a worthwhile approach – leading to Gears 5 being the great leap in a new direction for the series. As it is, Gears 4 boasts one of the most effective prologue sequences I’ve ever experienced. I was sceptical of this game when it was first announced, but as soon as I was thrown into this sequence I was sold on it completely. The game had my attention and didn’t let me down, which is why I’m so excited for Gears 5 doing things differently. It is important to note, and it is a fair comment to make, I think, that this would not have been possible – I don’t think The Coalition could’ve pulled this off – without Halo 4 as a foundation to build upon. Will The Coalition stamp their authority on Gears of War further if there are to be more games down the line? Chuck: Sure. I think so. For us again, it was… we had a great template in what 343 [Industries] did with Halo, right, because they took over a beloved franchise from Bungie. We were able to watch how they approached it, and what the feedback was and we were able to use that as a template for us to say, “Okay, let’s make sure we let the fans know that we know what we’re doing,” and then as we started to put new things in, we see things, whether it’s the weapons or it’s the enemy types or even the way that the environments work, or the story flows, things like that. That’s all The Coalition stamp on it. That now becomes the starting point for the next one and the next one and the next one after that. Did you discuss things with 343, did you meet with them? Osieja refers to having a sort of ‘template’ for approaching this, and Halo 4 was evidently a big part of that. Rather amusingly, Gears 5 looks like it’s going to be building itself on Halo 5 as well. There’s a switch in protagonist, as Gears 4 ultimately concluded with it being made clear that this new trilogy is Kait’s story. The Fenix family is now secondary to that. One of the main concerns is whether Kait will remain an ally or not, similar to the idea of the Master Chief going AWOL (which Kait does), as her connection to the Locust is growing stronger through messages and visions she’s having (like a geas in Halo, the “many gifts” that the Librarian unlocked for the Chief, but Halo 5 didn’t really care to deal with any further). Contrary to Halo 5 though, Gears has always done really well at funnelling its scope down to just a handful of characters. Halo 5 had eight main characters, not even counting the antagonists and other secondary and tertiary characters that made Halo 5 feel bloated, with a general sense that none of the characters got much exploration or development. Gears 5 has narrowed its focus down to Kait and Del in the main thread of the narrative, and we’ll presumably see what JD and Marcus are up to with the COG. Prologues can be tremendously useful, impactful, and even fun to read and write when you have the critical knowledge to really engage with them and understand what makes one and what breaks another. But it’s all very well and good for me to pontificate about this as a critic, isn’t it? Criticism seems so much emptier if you aren’t seen to engage in the craft of writing yourself. That’s why my last three articles have had bookend stories attached to them, as I often find myself wanting to show off some prose that helps to illustrate the point I’ve attempted to make. You can expect that to be a mainstay of every article to come from now, they’ve been received really well thus far and it’s a joy to write them. So, since I criticised the prologue of Halo 5, I took it upon myself to write an alternate prologue to the game (in the form of a script) that I very much hope you will enjoy reading. Open with a parallel shot of CATHERINE HALSEY’s eyes from the prologue of HALO 4. She looks more tired and gaunt than ever, after all she’s been through. Tell me about the children. Cut to: A parallel shot of JUL ‘MDAMA’s eyes, as he is sat in his ready room – illuminated by the blue glow of a holographic interface. Return to JUL in his ready room, HALSEY is silhouetted in the open door; JUL snaps out of his trance-like state but does not rise or even turn to face her. They were raised from childhood to be warriors. Cut to: A SANGHEILI (could be any one – intentionally interchangeable) undergoing training, starting with childhood and advancing with each line JUL speaks. Their minds and bodies honed from a young age. The SANGHEILI, in adolescence now, is seen sparring with three other warriors under the three suns of SANGHELIOS (a still, wide shot depicting the rocky, red, sand-blasted terrain – SUNAION is seen in the distance). Our lives are duty, discipline, battle, and death. JUL waves a hand for HALSEY to join him in the chair opposite. She sits. She did not expect to get JUL talking so easily. Of course, many of our children fell to your children. In battle, an armoured figure appears behind the SANGHEILI – a SPARTAN-II. The SANGHEILI’s face is reflected in its mirrored visor as it turns to see this new enemy. It is as if a dozen just dropped out of the sky, a brief parallel to HALO 4’s articulation of this scene but from the SANGHEILI’s point of view. Cut back to HALSEY, viewed over JUL’s shoulder, the camera is looking down at her but her head is raised high with a mixture of pride and defiance. And now you fight your own kind, while the Arbiter wants peace. The Arbiter has not seen what I have seen from your ‘ONI’ and what they plan for my people. He his blinded by his desire for redemption, while your kind seeks revenge. JUL glances at where HALSEY’s left arm once was. HALSEY smiles, the classic HALSEY smile – the kind that says about seven things at once without a word spoken, while savouring an irony only she is aware of. So you feel your choices are justified? My work – our work – will save my people. My children. The scene cuts away to HALSEY in her own room (though the time and location are separate, JUL’s dialogue continues over it). And what of your children, Doctor? HALSEY, too, is illuminated by a blue light from a holographic interface rising out of her journal – discarded on the floor. The camera pulls back to reveal the image of a great tree gradually building in front of her – a larger version of the one in her journal. What would you give to see them again? To know that they are safe? HALSEY stands and approaches, the camera sits behind her – placing her at the centre of the tree, the holographic branches look as if they are growing out of her and expanding across the room. These are all the lives she’s touched. More names become visible: SAMUEL-034, RANDALL-037, JORGE-052, ALICE-130, SERIN-019, etc… MIA/KIA characters are marked red (which takes up most of the tree). Focus is drawn to one branch in particular, panning across FREDRIC-104, KELLY-087, LINDA-058, and settling on JOHN-117. HALSEY reaches out to touch the image, in her own trance – a parallel to CORTANA. HALSEY’s hand passes through it, unable to touch. My god, that alternate prologue *chefs kiss* the parallel to Thel’s line that Jul couldn’t possibly know he’s making is just. Perfect. Great stuff! That line came to me while walking the dog (which is where I also got the idea for the tree from Halsey’s journal, as we walked through the woods) and it’s what made the whole scene click in my mind. Let the locust die. Everything after that point went from clever and new to derivative of the original series as the Swarm (which were new and neat) became peons to … Locusts. 5 however, with it’s open levels and concurrent campaign, sounds really interesting. And it looks like they might be moving back on the Locust a bit: the return to the New Hope facility and the new Swarm forms hint that they might indeed be switching gears (snrk) to the Sires and Swarm, and that we might finally get an answer to which of the two theories about where the Locust came from is right (the devs say it’s one of the two, but haven’t said any more). I can see why it may not be desirable to some people, but I actually love the direction they went with the Swarm. To me, Gears 3’s ending was as cheap as endings get – as I snarkily said in the article, they fire the Not-Halo-Ring and all the baddies conveniently die. Despite very interesting questions being raised by Myrrah about the Locust having a right to live, a share in this world, the game never cared to give any sort of substantial examination of the conflict we’ve been wrapped up in. I found it immensely disappointing. But then Gears 4 actually tries to do something with that. With the Locust threat seemingly over, they literally just swept them under the rug – piling them into mass graves and carrying on. It feels like a deconstruction of the convenience of Gears 3’s ending, as the world has moved on but faces the same problems that ultimately come down to the COG. There’s even the suggestion that the windflares are something the COG is responsible for, which sounds like a tinfoil hat conspiracy theory (and is certainly painted that way by Kait when she brings up Oscar’s idea), but we know that this is tech the COG has (based on the Maelstrom device that kept Azura hidden for the COG’s elite). With those same problems comes the evolution of their nightmare in the form of the Swarm. The Scions are also attempting to rebuild some element of the past from Locust society because their ultimate goal in Gears 4 is to make Reyna (and, after her death, Kait) their new Queen. I do actually like the alternate idea you suggest, that the Swarm could be a Locust attempt to gain immunity to Lambency – that could definitely work. But, looking at the long-term picture for how I see this trilogy’s story playing out, I think the direction they’re going with the Swarm is the most thematically appropriate thing to do. I think you might have missed a point about 3’s ending, however. The Countermeasure device wasn’t supposed to kill locust: it was a radiation weapon designed to kill the immulsion parasite. Anything that was sufficiently infected–human, locust, animal–died along with it when a bunch of their infected organs went up. 4 kind of missed the boat and did a little “whoops” by ignoring that fact, as well as forgetting that by 3’s own admission, some locust would have survived due to lack of immulsion exposure (which is why Queen Myrrah was knifed by Marcus) to be killed later by bullets. But no, if you think the whole question of the Locust deserving to live wasn’t raised in Gears, you missed a substantial portion of the story. The reason the Countermeasure was fired as late as it was is because Adam Fenix was trying desperately to find a way to kill the immulsion infection without wiping out the Locust. He’d been trying to for almost 3 decades. He failed, and Myrrah refused to accept it. It wasn’t supposed to kill the Locust, but that’s what it did. I didn’t say those points weren’t raised (and I’m not much appreciating your tone there), I said they weren’t substantially explored. That whole aspect of the story, as far as the games are concerned, was essentially introduced in the trilogy’s final act and it’s a far more interesting and compelling story to examine that was consistently brushed aside. You’re completely right about the “info-dump” being a big problem with prologues. I think Fallout 3 and Fallout: New Vegas are really good examples of this. Usually people have the interpretation that New Vegas is better than Fallout 3 in every way, but this isn’t the case here. Fallout 3 starts with a simple, personal story – and over the course of the main quest the story expands as bigger players and a bigger conflict is revealed. All the prologue tells you is about your character. Fallout: New Vegas, however, uses it’s prologue to explain your character, both main factions and their previous conflict, and the fact another conflict between these factions is coming. It’s really a shame: I think New Vegas would’ve been a far better game if they ddin’t lay everything out for you immediately. (Especially since, in the very first town, you can ask multiple characters about the main factions. I love that alternate prologue with Jul and Halsey. It gives Jul some much-deserved depth and provides a much more satisfying setup for the eventual meeting with Thel later in the game. I also love how that conversation about the Jul’s war with Thel parallels the incoming conflict with Locke and John (even if that conflict was not as nuanced or satisfying as it should have been). I think this is my first comment on your site but I’ve been reading since 2013, and I’ll certainly keep reading going forward. Suffice to say you have me hooked—keep up the great work! Glad you liked it! I was really happy with how it turned out as well, I had the whole scene play out in my head (music ‘n’ all) as I imagined it. A number of essential aspects of Jul’s character really haven’t been shown in the games, which, I imagine, is part of why 343 found it so easy to have him kick the bucket. So finding simple little ways to communicate some of those things was part of what really made that scene come together – showing a villain who STRUGGLES in some way is always going to make them more interesting. I really appreciate your readership! I can’t believe it’s almost been five years now, but I’ve got something special planned to mark that five-year anniversary later this month, as well as an article or two I’m working on for September. Glad to have you along for the ride!